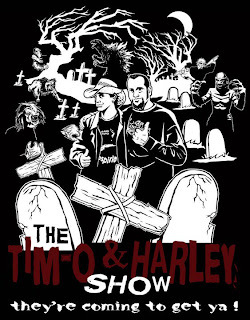 -Tell about you both and about your show “Tim-O and Harley Show” and how this all came to be? 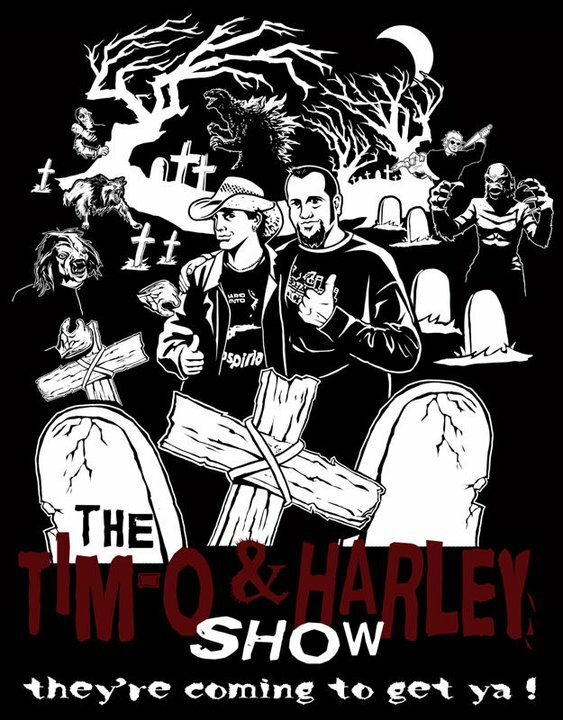 The Tim-O and Harley Show is a weekly podcast that centers around what Harley and I are "into" basically. This normally involves us discussing Bigfoot, music, conventions, and films we happened to watch that week. We also review 1 or 2 films which are almost always horror/exploitation/genre films. Harley and I met at a convention in Indy years ago and hit it off. 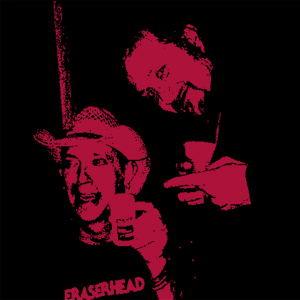 (At the time, He was selling t-shirts with Joel Robinson (artpusher.net) and I was acting and composing music for Hack Movies, which was owned by Kevin Strange who now runs Strangehouse Books.) Harley and I had many conversations about life and movies over cocktails at conventions and really became close. I was moving on from Hack Movies and my "other" career as a performing musician when it occurred to me to do a podcast. Harley was my first choice to co-host the show and luckily he agreed to do it. The rest is history! -What were some of the coolest things you got to see at the “Days of the Dead” from meeting people to seeing stuff? Oh boy! That's a tough one! There is always so much to see at the horror conventions it's hard to pick any one thing out. Harley and I always just love seeing our friends and meeting folks who listen to our show. It's fun to know people enjoy what we do and to hear the feedback we get. Well, at least the good feedback! -Do you all have any favorite horror films that were made in the last several years or are you strictly old school? Part II: What do you think about all the remakes, redo’s or Hollywood’s shame to make a quick buck? We are mostly old school fans. Our Favorite films are ones from the late 1970's and early 1980's. Halloween, Friday The 13th 2, Orca, Jaws, The Howling, The Funhouse, The Thing, American Werewolf In London, and Dark Night of the Scarecrow are some films we refer to a lot as our fav's. Some newer films we enjoy have been Behind The Mask: The Rise of Leslie Vernon, Dead Snow, Troll Hunter, Hobo With A Shotgun, and Tucker & Dale VS Evil. (Part II) We really have a disdain for remakes. Admittedly, some are better than others but even the better ones are so different from the originals that they could have been either new sequels themselves, or simply released with original titles with nothing to do with an existing franchise. A comment I've made on our show has been," Whatever happened to the good old days when Hollywood used to rip off plots instead of movie titles?!?" However, if the film is considered a remake but it's source material is a novel, I think it's unfair to compare movie to movie as opposed to movie to book. A good example is that every version of "The Thing" is based on the book "Who Goes There?" which I have read. It's interesting to note that both Carpenter's version and the newer "prequel" both draw from the original source MUCH more than the original Howard Hawk's version. In general though, Harley and I tend to look for new films with fresh ideas that stand on there own, even if they do tend to be hard to find. -Outside of the “Tim-O and Harley Show” do you guys have any hidden talents or skills that you can share with our PG-13 audience? Well, Harley is a screen printer and an amazing artist. We sell shirts at the conventions that are designed by Harley himself. You can contact him at The Screen-printing Factory's Facebook page at http://www.facebook.com/pages/The-Screenprinting-Factory/249037431773484. Believe it or not, Harley is also a pro wrestling manager that goes by the name of "The Potentate of Hate!". I'm a life-long musician and toured the country over 20 years time with Fragile Porcelain Mice and also Ultraman. I now put out self produced solo CD's that I sell on iTunes and at conventions. 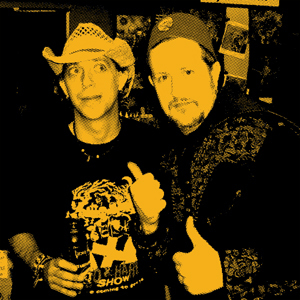 Another music project that I've been working on for the last couple of years is "The Tim-O and Danny Hicks Brain Invasion". It's a project that is co-produced by "Sir" Ian Baird that involves actor and good friend Danny Hicks. Danny is most recognized as "Jake" from Evil Dead 2 and "Skip" from Darkman. Danny is also in the Sam Raimi "camp" of actors and it's cool to see all those guys have stayed friends over the years. Bruce Campbell actually promotes our CD's on his website and even treated Danny, Harley, myself, and a few of Bruce's friends ( Deborah Foreman of Valley Girl, Erin Grey of Silver Spoons and Cassie Wesley-Depavia of Evil Dead 2 to name a few) to a classy steak dinner last year in Louisville. What an awesome guy and night! Bruce is a class act all the way. It's really been a lot of fun doing these CD's with Danny. He is a great guy and friend. Harley and I bring Danny to conventions with us from time to time too. The fans love him and he loves them even more! It's very cool to experience that with Danny. -If your life was a title of a movie, what would that be and why? "Twists and Turns" It's just amazing where life has taken Harley and myself. Sometimes good and sometimes not but never predictable. To say any more would be letting too many cats out of bags. shhhhh!!! -Tell us something that you would like us to know about anything? We also bring former WWE/ECW star "Rhino" to conventions sometimes too. Harley designs and makes Rhino's T shirts for him and Rhino is a good friend of Harley's. Rhino is also great with his fans, especially kids. Monstrous Movie Music: 4 New Releases!! THE HUMAN RACE TRAILER HAS ARRIVED!!! Death Comes In 3's... 9 Films, One Place!